This volume covers the multidimensional and international field of Heritage Language Education, including concepts, practices, and the correlation between culture and language from the perspectives of pedagogy and research. Heritage Language Learning is a new dimension in both the linguistic and pedagogic sciences, and is linked to processes of identity negotiation and cultural inheritance. It is a distinct pedagogical and curricular domain that is not exhausted within the domains of bilingualism and second or foreign language education. A heritage language is not a second or foreign language, it is the vehicle whereby cultural memory is transmitted over time, across distances, communities, and generations. Heritage languages play an important role ensuring the balance between coherence and pluralism in contemporary societies that have come to realize that diversity is an advantage for social, cultural, and economic reasons. The volume includes topics like First Nation indigenous languages, languages in diaspora, immigrant and minority languages, and contributions from North, central and South America, Europe, Africa, Asia, and Australia. 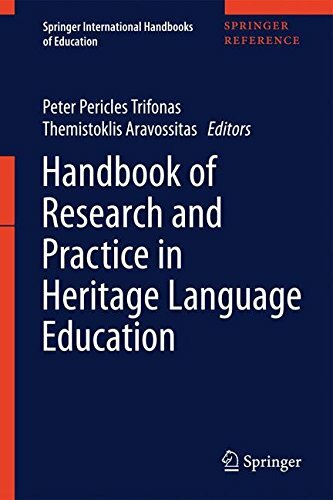 It addresses the social, linguistic, and cultural issues in educational contexts in a new way by taking up questions of globalization, difference, community, identity, democracy, ethics, politics, technology, language rights and cultural policies through the evolving field of Heritage Language Education.